Your production process is running smoothly, but without warning, your tank is about to run dry. Now you're going to have to shut down the line. Workers standing idle, revenue lost, expenses wasted. If only someone was monitoring the tank. Whether your tanks are running dry or overflowing, stop unexpected and unnecessary interruptions by easily monitoring remote and mobile tanks and totes with Banner's K50U tank level monitor. Banner tank level monitors are battery-powered and communicate wirelessly. They are easy to deploy, just peel and stick. Threaded housings make for easy installation. Banner tank monitors are so easy to use, you can swap them quickly to the next tote or tank when the previous one is empty. And because they communicate wirelessly, workers are alerted before your tanks run dry, no matter where your workers or tanks are. Be notified with a light on the line or a text message to your phone, an email to a supervisor, or an order to a vendor. 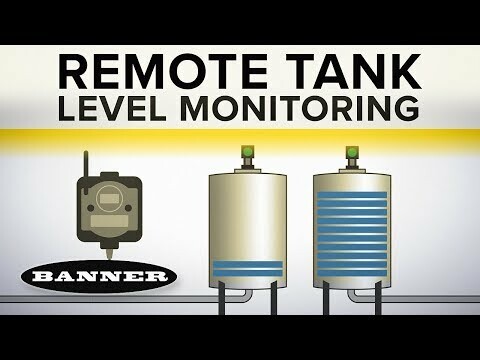 Banner tank level monitoring adapts to your manufacturing system, not the other way around. Your wireless network can monitor up to 47 tanks, or if you don't have 47 tanks, add other wireless machine monitoring and indication devices from Banner. Monitor your processes, collect the data, send it to the cloud, analyze your operation, and optimize your business. Keep your production process running with Banner's K50U tank level monitor. The future of industrial monitoring is made by Banner.